On December 3, 2012, 14 leaders from throughout Savannah’s neighborhoods celebrate the culmination of this fall’s Neighborhood Leadership Academy (NLA) at Savannah State University. Robert James, Step Up Savannah board chairman, offered remarks as well as Daniel Dodd-Ramirez, executive director; and Gwen Jordan, adjunct professor of political science at SSU, and NLA facilitator. Diane Jackson, a member of the class, presided over the ceremony. NLA is an intensive program designed to train and inform local leaders who will continue to serve as resources to Step Up as well as other local organizations working to improve social and economic conditions for Savannah residents. 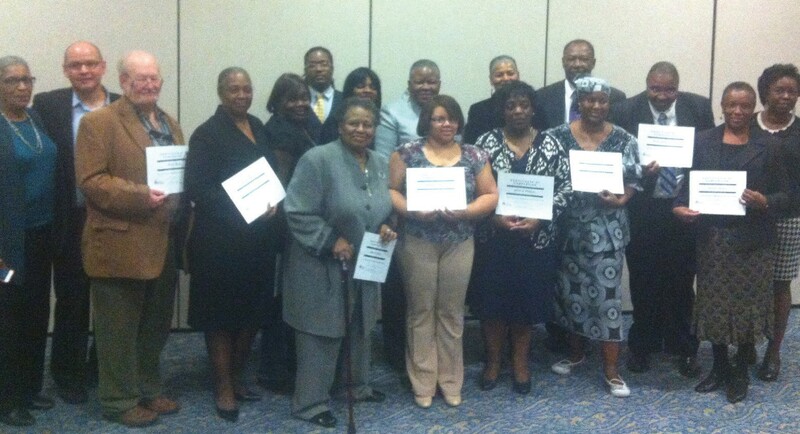 Established and emerging leaders from neighborhoods throughout the city of Savannah successfully completed a 12-week community leadership-training program; during their training, participants applied their acquired skills to real-life challenges experienced by Savannah’s residents. The graduation ceremony celebrates these individuals’ willingness to serve their communities, as well as their dedication to actively address poverty in Savannah. The Neighborhood Leadership Academy was made possible by a grant from The Charles A. Frueauff Foundation.